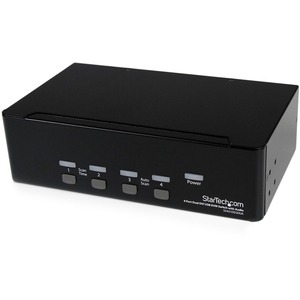 The SV431DD2DUA 4-port Dual DVI KVM Switch allows four PCs, each with dual DVI video outputs, to share two monitors, one microphone and set of speakers, one keyboard and one mouse as well as two other USB peripherals. An ideal solution for graphic designers, CAD/CAM designers or educational and financial institutions, the Dual DVI USB KVM Switch lets you instantly switch back and forth between dual DVI display PCs at the touch of a button, while maintaining professional level video quality on both monitors. 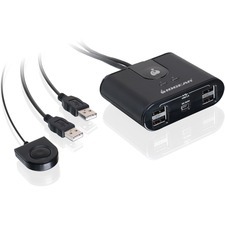 The dual DVI switch also features an integrated USB hub port that allows USB 2.0 peripherals such as thumb drives, external hard drives or web cams to be shared between attached systems, eliminating duplicate peripheral costs.